Today’s technologies in homes and small businesses require the most comprehensive surge protection on the market. big investment equipment, from appliances and computers, to HVAC equipment and TVs. 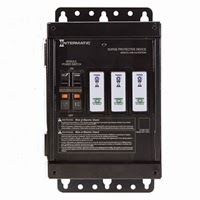 The Surge Protective Device uses replaceable Consumable Modules that allows your customers to easily and safely replace a module when the built-in LED light indicates it has been compromised. What makes the SPD superior?